From the era of silent movies through present day, Universal Pictures has been regarded as the home of the monsters. 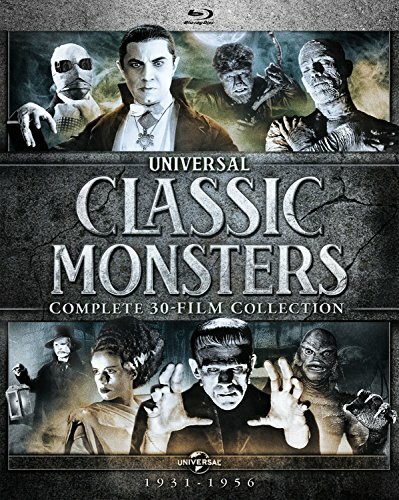 The Universal Classic Monsters: Complete 30-Film Collection showcases all of the original films featuring the most iconic monsters in motion picture history including Dracula, Frankenstein, The Mummy, The Invisible Man, The Bride of Frankenstein, The Wolf Man, Phantom of the Opera and Creature from the Black Lagoon. Starring some of the most legendary actors including Bela Lugosi, Boris Karloff, Lon Chaney Jr., Claude Rains and Elsa Lanchester in the roles that they made famous, these films set the standard for a new horror genre with revolutionary makeup, mood-altering cinematography and groundbreaking special effects. Featuring hours of revealing bonus features, these landmark movies defined the horror genre and are still regarded as some of the most unforgettable characters ever to be filmed.